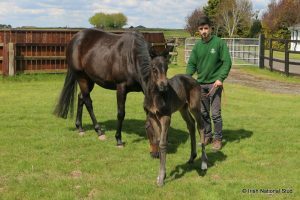 The Queen Snow Fairy delivered her handsome prince by The King himself Frankel on Saturday night. Weighing in at a whopping 64kg both Mother and son are doing exceptionally well. They had their first taste of the outside world this morning and the colt was ready for action at a little over 36 hours old. The Frankel colt was foal number 226 born this season, congratulations to the team on another job well done. Snow Fairy, trained by Ed Dunlop was bred and raced by Mrs Cristina Patino, won an incredible six Group 1 races, both the English and Irish Oaks, as well as Group 1 races in Japan and Hong Kong. She capped a marvelous racing career when beating Nathaniel in the Irish Champion Stakes at Leopardstown. Snow Fairy will now return to Simmonstown stud where she boards with Neil & Virginia Mc Grath.